Can you feel the chill in the air? Well we can't, but I'm sure some of you can. Can you see some of the leaves changing color? It's that time of year again...for FOOTBALL! Now that football season is underway that also means tailgating time. For those of you who can't tailgate at the stadium join us here! Bring over your party dish, special chili or wings, or pitcher filled with a punch! I am joining in and hosting Tailgating Time! Tailgating Time will be posted every Sunday at noon and open all week for you to add your football favorites. We'll play each and every week until Superbowl Sunday. I can't wait to see what you'll be bringing! If you are going to join us there is a giveaway this week for those who play along - a $65 gift code from CSN. "Here's what you need to do for your chance to win - Go to CSN using THIS LINK, come back to tell me in the comment section which coffee table you like the best, and link up your own football food recipe - you must do both to be eligible to win. CSN is responsible for prize fulfillment. The winner will be announced at round three of Tailgating Times next weekend." Lyndsey I'll try and join you most weeks, sounds like a lot of fun. Thanks for hosting! Our trees are just past prime color, and the leaves are starting to fall like crazy. Our nights are down in the low 40s. Won't be long now and we'll see snow on the tops of the mountains...I'm so not ready for snow yet. we have certainly elevated tail gating to a whole new level, the foods served range from the simple to the sublime...I can't wait to see some of the entries! Hi, thanks for visiting my blog! Nice to meet you! From what I have seen on yours thus far I will definitely be back. Another great event to join :) Will try my best! Wow, Lyndz, what a great event! Will write to you regarding this! Have lots of fun everyone. I love the idea, Lyndsey. And will check back often to see all the great ideas that I know you will be posting. I like that Wildon Home Benicia Lift Top Coffee Table in Dark Wood - 811359 by CSN stores. And tailgating food....how about some chicken? Hi, looks like a fun party! 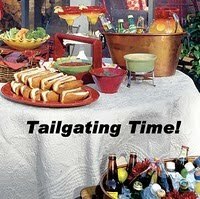 I love to tailgate, Cajun style, and will be adding my link soon! Great blog and recipes!